If you take the road which follows the Tuscan-Umbrian border you come to Pierle, a medieval hamlet in the hills between Cortona and Lake Trasimeno, its castle dominating the verdant valley below. 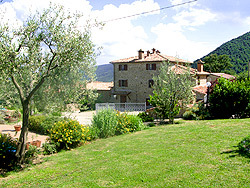 Here surrounded by olive groves and woodland of oaks and chestnuts, you will find the agriturismo Villa Cuiano. Whether you are a large family, a couple or a group of friends the agriturismo Cuiano is the ideal place for your holiday. Thoughtful restoration has preserved the Tuscan style of the stone built farm houses with chestnut beams and lintels and 19th C. stone fireplaces. Villa Cuiano is divided into light and independent apartments . Each apartment has autonomous central heating, satellite TV and music centre. The kitchens are well equipped including dishwasher. A welcoming open fire will keep you company if you decide to holiday at Villa Cuiano in the winter. In the extensive gardens around the Villa you will find quiet corners to sit and out door cooking facilities with a barbecue and a wood fired Pizza oven ideal for tasting local produce or taking an aperitif. The garden open as a terrace with a spectacular view of the volley below and of the distant Umbrian mountains and has frequently an ideal and idyllic setting for wedding and parties. At the swimming pool, exclusively, for the use of guests (12x6 m, 140 maximum depth) you will find sun beds, tables, chairs and umbrellas. There is play area for children, where they can play in maximum safely. Whether you love to trek or simply stroll in the open air you will find beautiful countryside all around the villa; marvellous footpaths through chestnut woods or ancient olive groves where in autumn you can gather chestnut and mushrooms.